I'm a bit late in post this edition of Can you CASE it Friday. I have no idea where the time goes! This time I'm casing a card I shared last Friday where I CASE'd a fancy fold card I received from Ellie Blake. 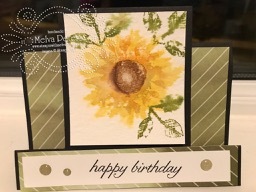 For this card, I CASE'd the water coloured sunflower and colours on a regular 4 1/4" x 5 1/2" card. And now, here's the card I created for a monthly swap that I'm in with some fellow demonstrators across Canada. Stampin’ Blends Available for Purchase Beginning November 1! Stampin’ Up! just announced that the Stampin’ Blends alcohol markers will be available for purchase beginning on November 1! So get your colouring fingers ready to order in just two weeks!! I'm so excited for you to be able to order them. I've had mine for a couple of weeks (one of the perks of being a SU! Demonstrator - we got to pre-order) and I've been colouring like crazy! They are amazing! Perfect time for an early Christmas present! Do you love Designer Paper? 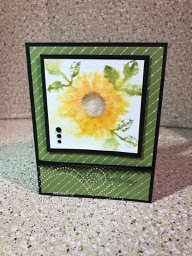 During October, Stampin’ Up! has a selection of Designer Series Paper that you can stock up on. Buy any three on this list and get the fourth one for free. This sale includes Designer Series Paper from both the annual and holiday catalogs. And they are even including select Specialty and Designer Series Paper Stacks on sale! So take advantage of this excellent opportunity to get lots and lots of pretty paper. See all the papers below or click here to print a list of all the papers. Use this host code when you order and receive a free gift from me! Weekly Updates and a Share! Can you CASE it Friday? Wow! So many things to share with you!